After ten successful instructional DVD courses on a wide variety of topics, Hendrik decided to add productions 11 and 12 in 2013, rounding it out to a full dozen. “Mortise and Tenon Joinery” is the second DVD newly released in 2013, but let us first hear about the long awaited production: “Honing and Setting Jointer and Planer Knives”. 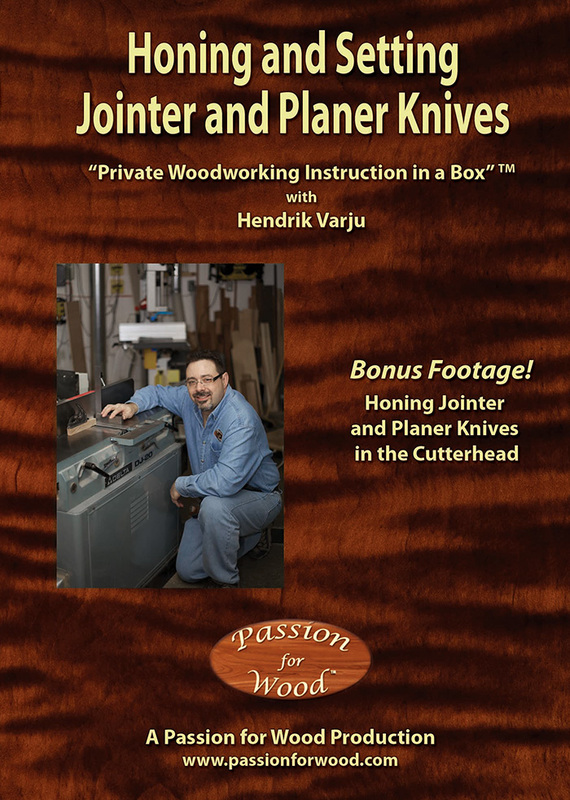 Back in 2007, Hendrik released his first DVD course called “Jointer and Planer Secrets”. Not knowing how successful the new undertaking would be, this was his shortest DVD course, being “just” a 2 DVD set running for just over 4 ½ hours. The success of that production gave Hendrik the incentive to make future DVD courses longer and even more detailed, with most of them running around 9 to 11 hours long. “Jointer and Planer Secrets” is still an incredibly detailed production that covers jointer and planer use and how to accurately mill stock that is concave, convex and even twisted. It also includes a long and detailed section on edge gluing techniques. However, that DVD course did not cover maintenance on the jointer and planer and especially knife removal, installation, set-up and honing. This new production released in 2013, “Honing and Setting Jointer and Planer Knives”, covers a great amount of detail on the relationship between jointer knives and the outfeed bed, how to remove and install new knives, how to set the knife height precisely and even how to hone them while still in the cutterhead. Similar information is covered for the planer, although the jointer is the machine that causes more trouble in general since it is the only machine in the workshop that can make your stock flat. A jointer that is not set up precisely, unfortunately, cannot perform its main function. The DVD starts by showing you how jointer and planer knives often come back from a sharpening service. While the larger nicks may have been removed, the level of grinding often leaves much to be desired. If the cutting edge is ragged and has metal burrs still on it, then it is not truly sharp. It is aggravating to spend the time installing new knives only to find that your very first cut is substandard. Hendrik shows you how to hone jointer and planer knives to a much higher degree of sharpness using ordinary waterstones or diamond stones. He even shows you the difference in sharpness you will achieve, as seen at 10x magnification. The second chapter explains in detail the proper relationship between jointer bed positioning relative to the height of the knives. Most people believe that the knives should be set to the same height as the outfeed bed, but this is just not correct. Hendrik explains why. Another chapter shows you how to safely remove jointer knives and do some cleaning/maintenance at the same time. Then a very long chapter goes through Hendrik’s techniques for installing jointer knives with high precision. It takes patience and time, but it is worth the effort. And the more times you practise Hendrik’s techniques, the faster you’ll get. Once three new knives are installed, Hendrik shows you how to test the jointer and make fine adjustments to the outfeed bed to eliminate snipe and/or a tapered cut. No matter how careful you are with knife setting, the outfeed bed positioning is critical. In fact, Hendrik even explains why there is an ideal outfeed bed height for different densities of wood, so often minor tweaking of the outfeed bed position is required when switching to a much different density of wood. Other chapters show you how to prepare your planer for knife changes in terms of removing the knives, cleaning the cutterhead, etc. Then Hendrik also demonstrates, in great detail, how to install a new knife accurately. All of Hendrik’s demonstrations are done on his 20” thickness planer, but the same techniques apply to smaller planers or even portable planers if they have the traditional jack screw and knife locking bar design. Some planers have “quick set knife systems”, which would make some techniques inapplicable. However, there are still many useful tips to be learned. Also this production focuses more heavily on the jointer since it is the fussier of the two machines and Hendrik’s jointer techniques apply equally to any jointer from 6” to 8”, 12” and even larger. While “quick set” knife systems do exist on some jointers, they are still relatively rare. The most important aspect of this production, as with all the others, is Hendrik’s full demonstrations done in real time. He doesn’t assume prior knowledge, so even a beginner will be able to follow along the journey. Yet he has a knack for covering the basics while simultaneously delving into super fine points an amateur is unlikely to even consider for many years. While it takes years to perfect these techniques on your own, Hendrik gives you complete access not just to his techniques, but also to the smallest of details that make all the difference in your work. Even the more experienced student will learn a great deal. Hendrik is known for his extremely long and detailed “bonus footage” sections in his instructional DVD courses and this DVD is no exception. The bonus footage is called “Honing Jointer and Planer Knives in the Cutterhead” and this section alone will save you hours of knife changing time and hundreds of dollars worth of sharpening costs in future. Over the years, Hendrik experimented with ideas to hone jointer and planer knives while still in the cutterhead. The problem is that it takes so much time to remove old knives and then install new ones to perfection. So if the knives could be sufficiently honed while still in the cutterhead, it would save hours of wasted time while also saving on sharpening costs. While these techniques aren’t suitable to remove large nicks in your knives, it does remove smaller nicks and brings the knives back to incredible sharpness, extending the time between heavier duty commercial grinding. After a few years of experimentation, Hendrik finally settled on reliable ways to hone jointer and planer knives in the cutterhead. This required certain approaches and concepts to be developed, but also some simple jigs. So this production shows you a simple jig Hendrik invented to secure a jointer cutterhead in the exact same position when honing each knife. You will be able to build your own easily. The jig works with your jointer’s rabetting ledge. If your jointer doesn’t have a rabetting ledge, such as some jointer/planer combination machines, Hendrik still explains how to index the cutterhead in the right place each time and all of the techniques still work. In fact, Hendrik has now used his techniques to hone knives on 6”, 8”, 12” and even 16” jointers. It also works with jointer/planer combination machines, including those with quick-set knife systems such as Wigo or Tersa cutterheads. While those systems work on a disposable knife concept, the replacement knives are quite expensive and Hendrik’s honing techniques will dramatically extend their lives. For the planer, Hendrik invented another shop-made jig to hone the knives in the cutterhead using a very small diamond plate. The jig rides right on the cutterhead itself and works beautifully. It works best on 15” and 20” stationary planers (or larger) where there is ample room to access the cutterhead from the top. But a similar jig made up in a smaller size would still work for smaller portable planers, as long as they have traditional cutterhead designs. Hendrik also shows you an even simpler quick honing technique that works on any traditional planer cutterhead even if the access area is much smaller. One can’t emphasize enough how incredible these new “honing in the cutterhead” methods have been for Hendrik and those he has taught these techniques, especially regarding the jointer due to how fussy it is to install knives correctly. Hendrik says he used to change his jointer knives about every 6 to 8 weeks but is now able to get about 3 to 4 honings in between each heavier duty commercial grinding. So now jointer knife changes are only required about every 6 months and that is for a small commercial shop. For most hobbyists, these techniques could extend your jointer knives from 6 months to 2 years or more. So not only does this avoid hours of frustrating knife changing, but significant jointer and planer knife sharpening costs as well. These useful jigs and techniques were published in Fine Woodworking magazine and in a FWW online article in late 2011 and early 2012. However, in this DVD production, you see the jigs explained in incredible detail and you see the techniques put into action in real time. Watching Hendrik hone his knives right in front of you is even more valuable, particularly when it comes to the nuances of the techniques. In short, “Honing and Setting Jointer and Planer Knives” is the most complete DVD course of its kind on this subject matter. You’ll appreciate the depth of the information and the subtle details fleshed out at every opportunity. As always, Hendrik’s DVD courses are not like the usual 45 to 60 minute production you may have found disappointing in the past. Hendrik takes you through every procedure in real time, ensuring that you fully understand the thinking behind every step. Most woodworking videos and television shows just show you the “gist” of each technique, editing away the finer details and problems that might arise. If you truly wish to elevate your jointer and planer knife honing and setting techniques to a professional level, the details are everything. Normally, Hendrik can only cover all of the high-level details he loves to teach in person, but he has once again succeeded at giving you personal coaching in a DVD format. As a 3-DVD boxed set running for over 6 hours, “Honing and Setting Jointer and Planer Knives” will become the leading instructional woodworking DVD in this area. As the trademarked name says, this is “Private Woodworking Instruction in a Box” and nothing short of Hendrik’s in-shop seminars and courses even comes close.